The USD/JPY extended its gains on the high ground alongside US yields. The inflation report stands out in the second week of October. The pair is flirting with overbought conditions. The USD enjoyed three positive factors. 1) Data: The ADP NFP showed a gain of 230K jobs, significantly above expectations. The ISM Non-Manufacturing PMI hit the highest levels ever. That gave the greenback the initial boost. 2) Yields: After getting closer to the previous peak of 3.13%, the benchmark 10-year Treasury yield shot higher and hit 3.23%, the highest since 2011. A higher return makes the greenback more attractive. 3) Powell: In his fourth public appearance in a week, Fed Chair Jerome Powell provided a surprise. He explicitly said that the Fed’s policy could turn temporarily tight: interest rates above the level of inflation. This comment of his added further support. The US reached a deal with Canada on a new NAFTA deal, now called the USMCA. The news is not supportive to the safe-haven Japanese Yen. A lack of any developments on the Chinese front also diminished demand for the Yen. On the other hand, the Trump Administration broadened its broadside against China. Vice President Mike Pence accused the world’s second-largest economy of industrial espionage, allegations that Beijing denied. Tech stocks, especially in China, did not like it. US traders are enjoying the Colombus Day holiday on Monday, an event that is set to lower trading volumes. A significant release awaits traders on Wednesday, the Producer Price Index (PPI) for September which serves as a warm-up to the inflation report on the following day. The focus is on the annual core figure that hit 2.3% in August. 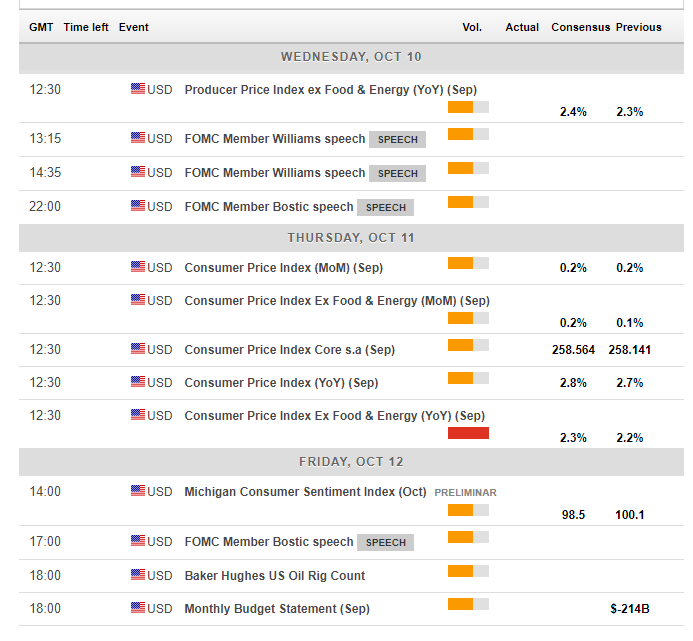 The primary economic indicator of the week is due on Thursday. The US publishes the Consumer Price Index (CPI) report for September. Back in August, Core CPI suffered a setback with a deceleration from 2.4% to 2.2% after several months of accelerations. The Fed closely follows the Core PCE but it lags the Core CPI released now. Apart from the annual figure, the monthly Core CPI and the headline CPI are important. The last word of the week belongs to the University of Michigan’s preliminary Consumer Sentiment report for October. Confidence stood at a high level of 100.1 in August. The parallel CB Consumer Confidence is at the highest levels in 18 years. All in all, it is a relatively light week in terms of indicators and there are no new trade-related deadlines. Nevertheless, President Trump can always surprise and the mid-term elections are beginning to gain attention as well. The Japanese yen does not attract safe-haven flows on trade news. But, when stocks react in an adverse manner, the Japanese currency is on the rise. We have seen this phenomenon over and over again. If the US broadside against China intensifies and equities drop, the pair could drop as well. 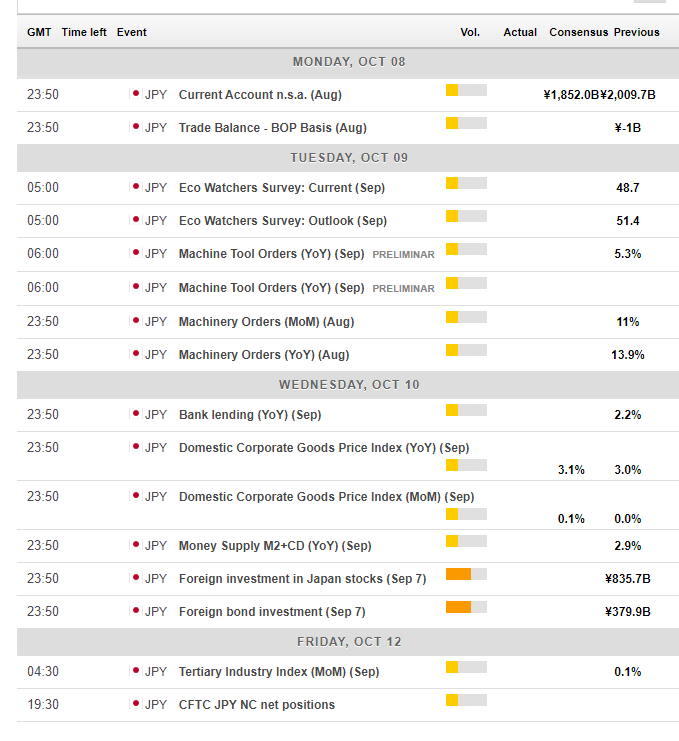 The Japanese economic calendar features the Current Account and Trade Balance numbers early in the week, Machine Tool Orders later on, and figures on foreign investment stand out toward the end of the week. As is usual with Japanese data, it tends to have a minor impact and considerable surprises are needed for a meaningful market reaction. The USD/JPY continues trading in the steep uptrend channel that characterized accompanies it since early September. The Relative Strength Index on the daily chart is below 70, thus outside overbought conditions. The pair remains well above the 50 and 200 Simple Moving Averages on the daily chart, all bullish indicators. 114.05 was a temporary cap on the way up. 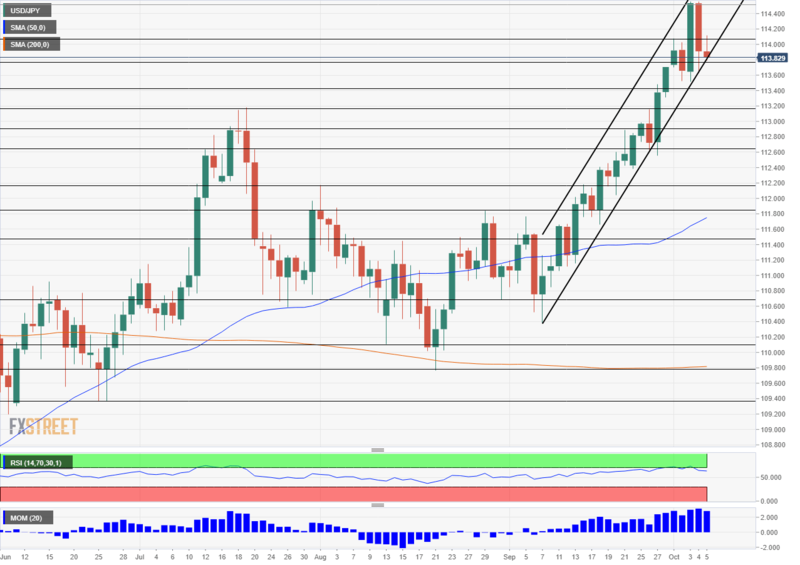 114.75 served as resistance in November 2017 and the USD/JPY got close to the line. The next hurdle is relatively far: 115.50 was a high point in March 2017. Beyond this level, 116 and 117 are noteworthy. 113.75 was a high point in December 2017 and is a significant battle line. 113.45 supported the pair after the surge to higher ground in early October. 113.15 capped the pair in August and 112.90 was a stepping stone on the way up. With upbeat data and a hawkish Fed, there is more room for rises. However, given the current trading conditions, we may need to see a temporary setback or at least a period of consolidation before significant gains can be seen.